While it seems like a simple question that should have a simple, straightforward answer, it’s not so simple! There is no 1 size fits all answer to this question unless you’re ready to shell out a lot of $$ for something like the Walco addressing system pictured below. But 99.5% of our clients are not prepared for anything close to that. So we need more information! What will you be printing? Just the delivery address? Return address? Indicia? Marketing message? This one question dramatically changes how much you will need to spend and your options. 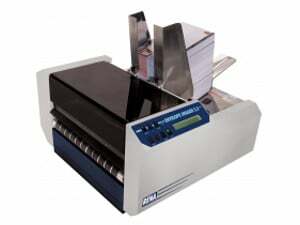 For example, if you only need to print the delivery address, then “the best printer for envelopes” for your application may be something like the Hasler AS930, Pitney Bowes DA80f or Rena Imager 1.5 shown below. New, one of these units sells for around $7,000+. Still too much money? 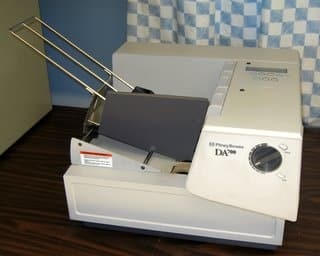 Then we need to look at a refurbished/used printer like the Rena Imager I DA612 shown below for about $2,500 or a Rena 1.5 maybe even a laser envelope printer. 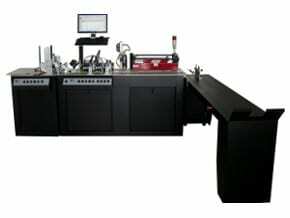 If we look at the laser, your volume needs to be low, and even then if the envelopes are not perfect, you will be fighting with it and tearing up the printer. Especially if you don’t get a laser with a straight-through paper path. Forget doing anything with a coating like a glossy postcard. Now if you need to print the return address and delivery address you could always put the mailer through one of these printers twice. Once to print the return address and a 2nd time to print the delivery address. Or you have 2 other options. 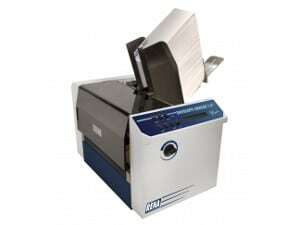 Go with an envelope printer with a shuttle head that can print almost anywhere on a number 10 envelope. Like the Secap 13K shown below, but with more moving parts comes more service calls and less durability. Which is fine, if your volume will not be that high. The 2nd option would be to go with a printer with more print heads. Like the Rena Imager 2.5 pictured below or 3.0. New they go for around $12,000 and up. 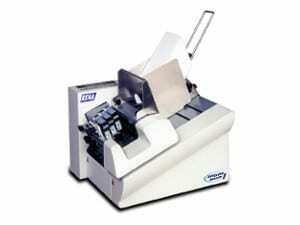 Of course, you can always call us for a price on a used envelope printer. There’s always eBay or some junk dealer that does not know and thoroughly understand the addressing industry. But take into consideration one of the following recent examples. A potential client called up, and one of our salespeople spent about 2 hours with him to figure out the best printer for his needs. He then found the same unit on eBay for $500 less. Sounds like a good deal right? Not really. By the time the buyer purchased the ink, interface cable, paid a technician to replace the feed rollers and separators, he had spent $560. Then he took the mailing to the post office, and it was rejected because the barcode was not printed correctly. He then had to pay someone else to help him set up the software properly and redo the mailing. Costing another $180, plus the time and material. All of this could have been avoided if he purchased it directly from All For Mailers Inc.
Now we have yet to consider the thickness of the mailer, color, what program you will be printing with or the material you will be printing on! All of which can be game changers! Save yourself time and trouble and give us a call! We go over all the mailing equipment we sell and replace anything that needs to be replaced. We then thoroughly test every unit and make sure it is functioning properly. We have setup videos for almost all the units we sell, to help you get set up and running fast! Because no one likes reading the long boring manuals, but we still send you the manuals. We include ink and interface cables. We will even connect to your computer, install the drivers and help you set up your software. Saving you a ton of time, aggravation, and possibly from getting you mailing rejected at the post office.